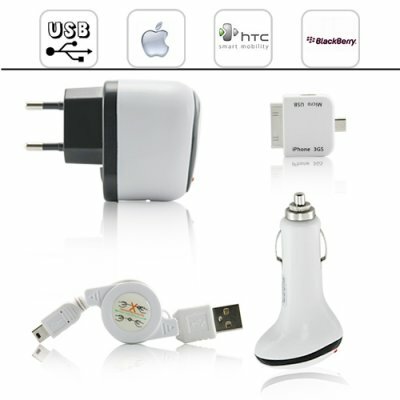 Successfully Added Universal 4 in 1 iPhone USB Adapter and Charger Set to your Shopping Cart. Introducing the Universal 4 in 1 iPhone USB Adapter and Charger set for your iPhone, Blackberry, HTC or any other cell phone, smart phone and PDAs. This handy USB adapter and charger set can charge your phone at home or inside your vehicle, it can also be used to connect your cell phone to computer or other USB devices. This adapter/charger set is an ideal accessory to have in your home, office, car or even in your travel bag. For the retail price of a single adapter you can have this 4 in 1 set that can be used for almost every cellphone. If you're in the resale market then the 4 in 1 iPhone USB adaptor/charger set is a quick and inexpensive way to make some good profit with minimal effort. In stock right now and ready to express ship to you, from the best electronics wholesaler - Chinavasion. Great accessory for your iPhone, iPod, iTouch, iPad and iEverything. What is the difference between a Mini USB and Micro USB connector? The micro USB connector offers many advantages. The most obvious benefit to this new technology is its smaller size. It is also the standard charging port for most cellphone models coming out this year. Can I use this to charge my iPhone/iPod/iTouch when I am driving? Can I use this set to connect my cellphone to my computer? What cellphone makers can I use this 4 in 1 adapter/charger set with? With the apple dock connector, the Micro USB, and Mini USB, you can use it on pretty much any cell phone on the market right now. You can use it on iPhone, Blackberry, Motorola, Nokia, LG, Samsung, Sony Ericsson and many others. Please check connector type of your particular model.